Popular CBeebies series Driver Dan is brought to life with the fantastic Driver Dan’s Story Train toy from Golden Bear. In the TV show, Driver Dan tells all of his different passengers and friends a series of stories and tales, and this new toy will encourage young fans of the show enact some of their favourite moments. 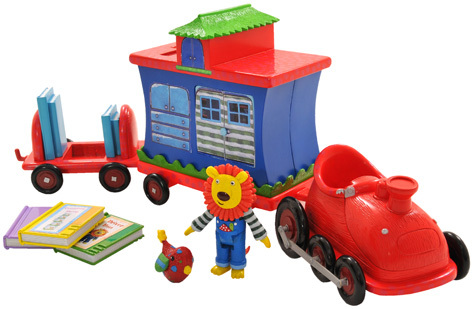 With this toy you can join Driver Dan aboard his story train with Twinkle leading the way. Featuring the engine, a passenger carriage and the book carriage, children can pick one of the three books included, place it into the slot, and magically hear Dan narrate one of their favourite stories! So what are you waiting for? Pop Driver Dan into the train and put Twinkle on the funnel and start pushing the train to Story Corner! Please tell us what you think of Driver Dan's Story Train Toy by Driver Dan's Story Train and Golden Bear.